America is in trouble. We face four major challenges on which our future depends, and we are failing to meet them―and if we delay any longer, soon it will be too late for us to pass along the American dream to future generations. 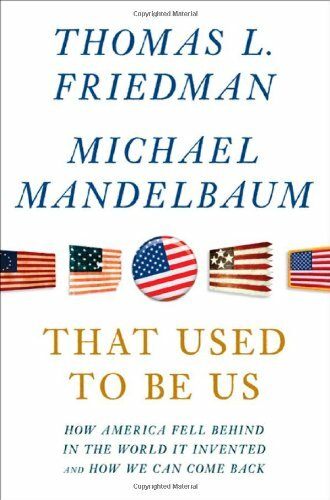 In That Used to Be Us, Thomas L. Friedman, one of our most influential columnists, and Michael Mandelbaum, one of our leading foreign policy thinkers, offer both a wake-up call and a call to collective action. They analyze the four challenges we face―globalization, the revolution in information technology, the nation's chronic deficits, and our pattern of excessive energy consumption―and spell out what we need to do now to sustain the American dream and preserve American power in the world. They explain how the end of the Cold War blinded the nation to the need to address these issues seriously, and how China's educational successes, industrial might, and technological prowess remind us of the ways in which "that used to be us." They explain how the paralysis of our political system and the erosion of key American values have made it impossible for us to carry out the policies the country urgently needs.